KCB, CMG (1871–1965) Fought as a junior officer in the Second Boer War (1899–1902), and as a senior officer in the First World War (1914–18), but is now remembered chiefly for his part in the Irish War of Independence (1920–21) and the Palestine Police. Born in Devon in 1871, he enrolled in the Royal Military Academy, Woolwich in 1888, and was commissioned in the Royal Horse Artillery in 1890. He was stationed in India from 1890 until 1897, when he returned to England. He was sent to South Africa during the Second Boer War where he was badly wounded at the Battle of Magersfontein (11 December 1899), but recovered and returned to duty. His extensive service in South Africa was reflected by his campaign medals: the Queen's South Africa Medal with four clasps, and the King’s South Africa Medal with two. After the South African war ended, Tudor went back to India for another five years (1905–10), and then was posted to Egypt, where he stayed until the start of the First World War. Tudor served on the Western Front from December 1914 to the Armistice, rising from the rank of Captain in charge of an artillery battery to the rank of Major General and the command of the 9th (Scottish) Division. He continued to command this formation after 11 November 1918, as part of the Army of the Rhine, until the 9th Division was disbanded in March 1919. By all accounts, Tudor was a professional and forward-looking artilleryman: historian Paddy Griffith has described him as an "expert tactician." He was the first British general to use smoke shells to create screens, and one of the first advocates of predicted artillery fire. He suggested an attack with tanks in the Cambrai sector in July 1917, and his ideas helped lay the foundation for the British breakthrough in the battle there in November. In addition, he was a fighting general who spent a lot of time in the front lines: he was almost killed at the Third Battle of Ypres in October 1917, when a shell fragment hit him in the head and smashed his helmet, and he was almost captured by the Germans during Operation Michael, the first German offensive in the spring of 1918. When Tudor took up his new post, the Irish War of Independence was approaching a crisis: indeed, within a couple of months, the British regime in Ireland was on the verge of collapse. 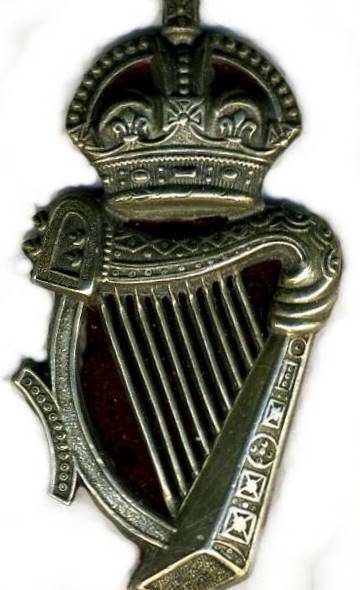 The Royal Irish Constabulary's morale and effective strength were both declining: IRA activists were ambushing police patrols, burning police barracks, and organizing boycotts of police and their families. Railway workers went on strike, refusing to move trains that carried armed police or troops. Merchants refused to serve police customers. Police recruits and servants were being attacked and intimidated, and women who were friendly with police had their hair cut off. Police property was wrecked and stolen: in some cases, police bicycles were taken away while their owners were in church. The Irish Republic proclaimed during the Easter Rising of 1916. Local governments were acknowledging the authority of the First Dáil. IRA Volunteers were acting as Republican police. Republican courts were adjudicating both civil and criminal cases. In many parts of Ireland, the Republic was becoming a reality. Tudor's assignment, as he saw it, was to raise police morale, to punish crime, and to restore law and order: "I had nothing to do with politics," he wrote years later, "and don't care a hoop of hell what measure of Home Rule they got." At a Cabinet conference on 23 July 1920, while his Dublin Castle colleagues were calling for an offer of Dominion Home Rule, Tudor was confident that, "given the proper support, it would be possible to crush the present campaign of outrage." "The whole country was intimidated," he said, "and would thank God for strong measures." The Government chose the hard line: in 9 August 1920, Parliament passed the Restoration of Order in Ireland Act, which gave Dublin Castle the power to govern by regulation; to replace the criminal courts with courts martial; to replace coroner's inquests with military courts of inquiry; and to punish disaffected local governments by withholding grants of money. assassination is rife and the G.S. [General Staff] have now adopted it a lá Tudor and Co.
After a Roman Catholic priest was shot dead by an insane Auxiliary in December 1920, a Castle official noted in his diary that he felt some sympathy for the killer, "as these men have undoubtedly been influenced by what they have taken as the passive approval of their officers from Tudor downwards to believe that they will never be punished for anything." Tudor remained Chief of Police until his forces had been demobilized and the RIC was disbanded. In May 1922, Churchill (who was also Secretary of State for Air) found a new post for his friend in the troubled Palestine Mandate, where Tudor became Director of Public Safety, with the temporary rank of Air Vice-Marshal. The following month, Tudor became the air officer commanding the RAF's Palestine Command. He remained as AOC until February 1924 when he handed over to Air Commodore Eugene Gerrard.Interestingly, while in Palestine, Tudor created a Gendarmerie whose European section included many former Black and Tans and Auxiliaries. In 1923, Tudor was made a Knight Commander of the Order of the Bath. In 1924, he retired both from his position as Palestine's Director of Public Safety, and from the Army. He then emigrated to Newfoundland, where he remained for the rest of his life. In the 1950s, Tudor's presence in Newfoundland became known to the Irish Republican Army and two of its members were sent to St. John's to assassinate him. Their planned assassination was not carried out after consultations with a local Catholic priest, Rev. Joseph McDermott, who informed them that their escape plan was bound to fail. Tudor died of natural causes in St. John's, Newfoundland on 25 September 1965. His body lies in the Anglican-Protestant graveyard next to Her Majesty's Penitentiary on Forest Road. Many later accounts sugest that not all the activities associated with the black & tans were actually the work of the black & tans. Their presence in Ireland was a direct result of the above mentioned IRA campaign of ambushing police patrols, the burning of barracks etc which was designed to provoke a strong police & military response thus inflaming public anger & generating greater sympathy for the IRA's campaign & objectives. The Regular well trained & diciplined British army was greatly depleted following the loss of over 900,000 men in WWI, tens of thousands of which were from Ireland. Hundreds of thousands more who did survive WWI returned with severe psychological or physical injuries or in many cases disabllities. .
As in all conflicts when law & order breaks down, more than one version of history & truth, prevails. It is said that in war the first casualty is truth, this is always worth remembering as the reputation & career of a distinguished soldier like Sir Hugh Tudor deserves full, proper & dispassionate study.